Protect your Data with a NAS Storage Device ! Protect your business data with a Network Storage Device or NAS. This is a Synology NAS device with 2 Drive Bays. 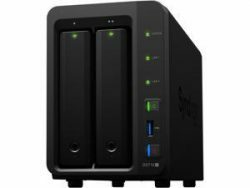 There are a wide variety of NAS devices to suit your needs. Free standing, as the one pictured, or Rack Mount NAS devices for Server Racks. Contact us to discuss the options. This Managed Hardware Service requires a One to Two Year Contract commitment. Your Signature on the Checkout Page is your confirmation and acceptance of this contract and its terms. The first months payment and Deposit is required on sign up. Recurring monthly payments are by an automatic payment each month. You will be notified via email 5 days prior to billing and charge of your credit/charge/bank card. A receipt will be emailed to you following the charge, and you will have access to your own account on our website. Upon the ending of the contract you will be offered the option to purchase the device or replace with a new NAS Device and New Contract. you are on the Checkout Page confirm ‘Save payment information to my account for future purchases’, and acknowledge this agreement by Signing the Signature pad to complete the subscription. No information is saved on this site for your protection. The payment card details are retained on the payment processors site. Delivery is provided to businesses in the Los Angeles Area Only. Shipping will be provided to other areas. The NAS devices location is required to have the network wiring installed and connected to the network/computer(s) and an active internet connection. The Manufacturer’s Warranty is Extended during the contract duration. The warranty excludes damage from water, heat, exposure to high levels of magnetism, misuse or improper handling. Acts of Nature, theft, or damage from any or all other sources are not covered. Any excluded damage will be the responsibility of the business including all financial charges for repair or replacement.